Wow! 14 runs and only one homerun? That is a lot of hitting! Muy Graci on the Haiku comment too.. .and the text thing takes a smidge longer.. but I think it makes for a more compact read. Whataya think? Oh gosh.. sorry bout that on that stupid address was in my paaste…. yikes. Yep 14 runs and only one homerun! It would be nice clinching at home but a little nerve wrecking. I was in San Fracisco the last time we clinched the W.S. there and there was a sea of Blue there celebrating. I am going to San Diego on the 29th so we will see what happens. We still have four at Pittsburgh. I removed your address. Sweet Lou is the nicest person. I ran into him at Roger Dean’s parking lot. My friend and I did not have tickets to the game as it was sold out but we told him we were contect to be there and just wait for our friend that had tickets. He got us in and the following day at Vero Beach he joked that it was us that got him into Roger Dean. Very, very sweet person. You always see him smiling at the stadium. Fantastic offensive show by the Dodgers in that one! And great pic of you and Kemp, Emma! Thanks Jane! I was watching the game in delay after I got home and in the first inning Livan Hernandez was actually laughing cause he got out of that inning. I was saying to the TV “Wait till you see what happens to you later.” lol. We all talk to the TV, right? Jeff! haha, 7 and 2 are my lucky numbers. When you posted that I rememebered that I do have pictures with Sweet Lou Johnson. Maybe I’ll update the post. Emma, the pics with James and Matty are great! Emma: It’s comforting to know that your team can score runs in a variety of ways. 14 runs and only 1 via home run is comforting. Hits, hits, hits. In the postseason, you are probably going to have to build runs. The longball may be hard to come by. Nice job Dodgers! James & Matty are adorable. They are both having very solid years. 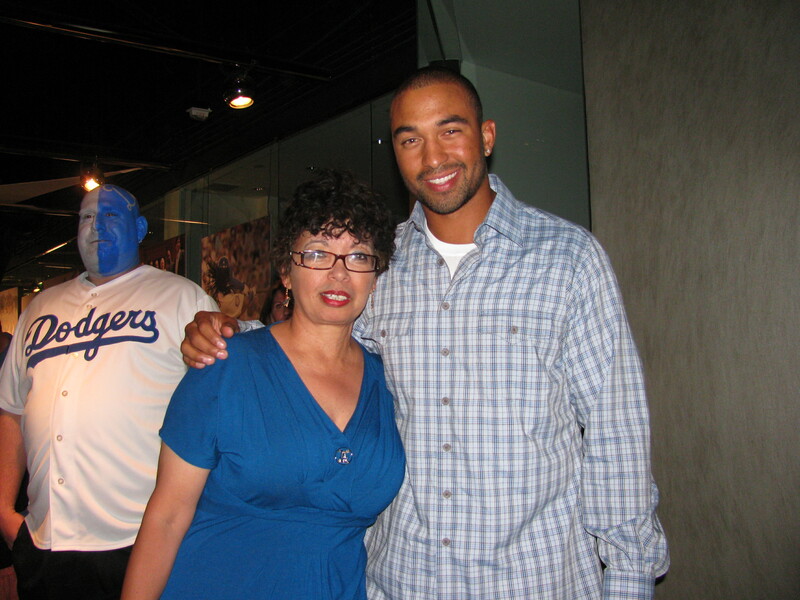 That guy in the background of the pic of you and Matty is a true Dodger fan! Nice face paint! thanks! Nice twitter page you got there! The guy with the Dodger Blue paint on his face is always at the stadium. He comes out in the Bluetopia movie saying “this is my church.”. haha, we might have bumped into each other at that game in San Francisco. Haha, it looked like “our house” with all that blue”. That was great clinching at San Francisco. See, that is what I say of our loss yesterday that it was not that bad. I have to look at the positive and I saw some with Bilingsley on the mound. Just looking at the score does not tell the whole story. Its always fun to see how scoring early plays out to a big win. It seems that the Dodgers have really been scoring!! 😉 Its always fun when your team has more than the other team. haha new post up. We lost last night but that is the good thing about baseball, you come back the following day and you think about winning series more than games. Magic number: 8. Happy 82th Birthday Tommy Lasorda! 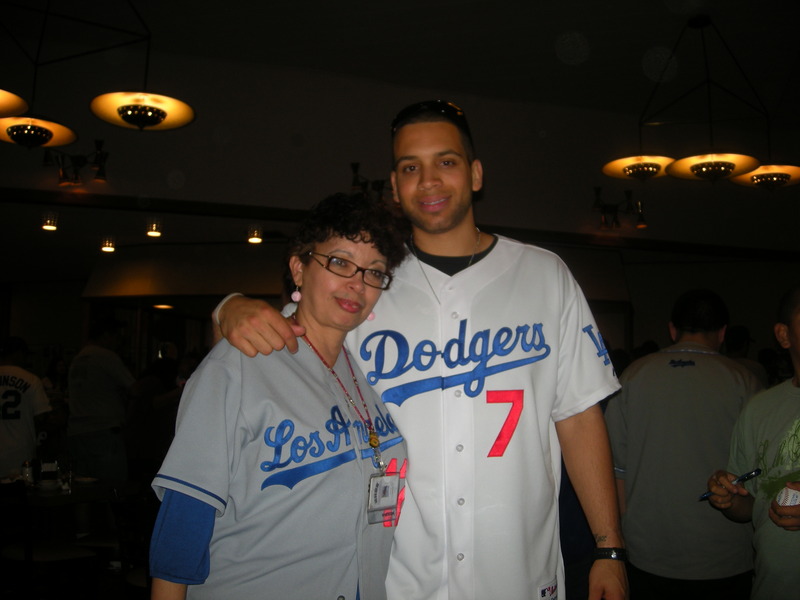 Washington DC, The Dodgers and an Event I Attended.